Chairman of Vovinam Federation in Africa Mr. Mohammed and Mr. Djamel Tazibt Djouadj – Martial Arts Federation chairman Algeria has the body to Vietnam on the evening of May 17 for a meeting with leaders of the World Vovinam Federation (WVVF) of the preparations for the World Championships 4th 2015. The event was held in Algiers in late July. 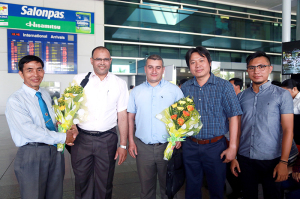 Vo Danh Hai – Vice Chairman of the World Martial Arts Association (WoMAU), Secretary General of the World Vovinam Federation (WVVF) – (2nd from right) and Master Nguyen Chanh Tu (leftmost) welcomed Owner AVF president M. Djouadj (second from left) at Tan Son Nhat airport. Leaders welcomed the African Federation at Tan Son Nhat airport Vo Danh Hai – General Secretary of the World Vovinam Federation and Master Nguyen Chanh Tu – Head of Scientific Research Vietnam Vovinam Federation, Member of the Board Check WVVF and had many years in the teaching and development of the movement in Africa. Contents of this meeting is to conduct exchanges and discuss plans between the members of the Executive Committee of Federation world championship preparation 4th World Vovinam slated from July 27 – August 2 in the city of Algiers, Democratic Republic of Algeria. Vo Danh Hai – WVVF Secretary General and Chairman of the African Union in Voviam founding congress of Federation of Africa in Algeria in 2012. According to Secretary General Vo Danh Hai WVVF movement Vietnamese Vovinam masters Vo Dao was introduced Djouadj Mohammed promote and to be taught in Algeria since 2001 and has made great progress. Especially after joining the World Vovinam Federation and WVVF sent many senior grandmaster Nguyen Van Chieu, Nguyen Chanh Tu, Nguyen Khac Huynh to train African and Algeria. Currently, Algeria has nearly 150 clubs Vovinam and attracted nearly 20,000 students participated in practice this martial art. Exercise class has more than 2000 students with practice in Algiers was voted class many martial record set by the Organization most Vietnam record awarded. At the World Vovinam Championship 2013 held in France, Algeria is the country with the whole team to third place, with 17 medals, including 6 gold medals, 5 silver medals and 6 bronze medals. Reportedly, the program supports developing Vovinam movement in African countries also lies in the cooperation program between Vietnam state level and Algeria in the near future. During his official visit to Vietnam, besides meeting preparing for the World Vovinam Championships, two African delegates will also visit Vietnam Fatherland Vo Dao road, meeting with senior Vovinam masters and sightseeing some cultural and historical landmarks of Ho Chi Minh City and some Vovinam club in the city.